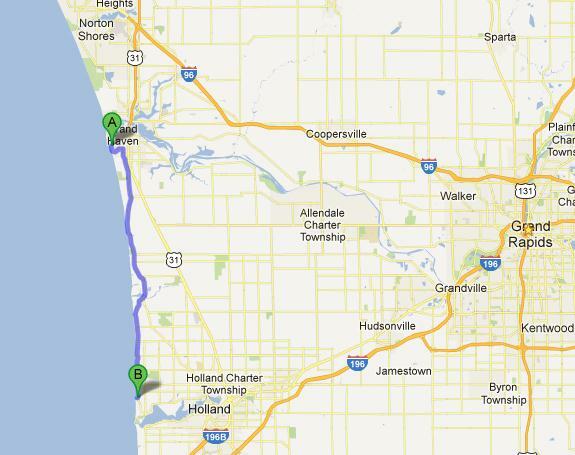 You can see from the contour of the map that a straight North is off shore in Grand Haven. Tunnel Park is rideable on a North and has easy access to the lake. As Michigan started feeling the effects of tropical storm Sandy, Jetty and I were out searching for a good spot to go kiteboarding after work. We stopped at City Beach in Grand Haven and saw a couple kiters setting up, however the wind was straight North which is slightly off shore in Grand Haven. The conditions looked marginial so we headed further south down to Tunnel Park on the south side of Holland since the Holland wind meter was showing a steadier wind. Jetty has been to Tunnel Park several times but this was a first for me. I now know the reason it’s called tunnel park is because there is a tunnel straight through the dunes to the lake(duh). We ran through the tunnel down to the lake to check conditions since we weren’t 100% sure they’d be better than GH but they were. The wind was straight side shore and blowing around 25 knots. This got my blood pumping since I was excited to try out my new 11M Switchblade that I picked up from Mackite over the weekend. We ran back to the car and got suited up. By the time we got back to the beach the wind had dropped off but we were pretty confident it would come back up again. Jetty put his kite up in the air first and was struggling to stay up wind. I had a hard time staying up wind too but as I was walking my kite back up the beach the wind started picking up again along with my adrenaline. It was a little light heading out but by my first tack back it was blowing strong but gusty. The waves on the lake were sloppy and a little unpredictable. The break farthest out was a little cleaner and around 5 feet high. I still don’t have a good fall wetsuit yet so I was hesitant to go out too far. The sunset tonight was awesome and made a great backdrop for the session. I did have one hairy moment when I lost my board near the far break. Being in a 4/3 wet suit with a shorty underneath I was aware that I was not in a good spot with waves ready to bear down on me and flush my wetsuit with cold water. I body dragged to my board and made a b-line for the shore. A big wave was coming so I didn’t have time to put the board on and just body dragged the whole way to shore. I even caught a wave body surfing with the kite on the way. After a few more tacks the sun was setting and we decided to call it a night. Wave Height Forecast for 1 PM tomorrow. The scale doesn’t go high enough! A couple notes about tomorrow… Tomorrow is supposed to crazy on Lake Michigan. Forecasters are calling for 33 foot waves. 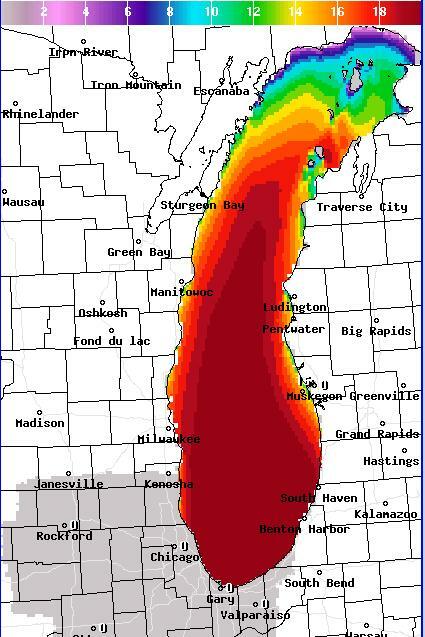 In fact if you check the graphical NOAA forecast for wave height the entire south half of Lake Michigan is colored red indicating wave heights of over 20 feet. Of course the wave height is being driven by the insane wind conditions that I’m hearing out of my window tonight that will continue to tomorrow. The NOAA forecast shows consistent average speeds of 40 knots gusting over 50 knots throughout the day. If you want to check the real time conditions on the lake you can always look at the south open water buoy 45007. If you can’t get down to the south end of the lake to see the 33 footers in person you can check that buoy to see if the forecasters were right. Also I have to share this video that my buddy sent me from CNN. Some kiteboarders nuken it in Massachusettes off the tropical storm. Tomorrow’s your chance to rip it like this on Lake Michigan!